This novel is so very close to my heart for many reasons. For one, it brought me and my wonderful agent, John M. Cusick together. This was the novel I’d pitched him way back in 2011 and lucky for me he saw something in it he liked enough to fish it out of his churning slush pile. Back then, it was like a lump of raw dough–tasty perhaps, but pale and shapeless. I’ve spent the years since rewriting, reworking, revising, molding, morphing, and sculpting until the story became the novel it is today. I was beyond thrilled when my editor, Emily Feinberg, accepted it for publication. 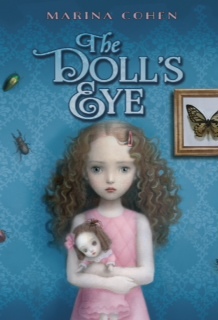 I’m so very excited to reveal my awesome new cover created by the extremely talented Nicoletta Ceccoli. The artist, along with the wonderful team at Roaring Brook Press, worked very hard to get this cover just right! THE DOLL’S EYE is set to release February 28th, 2017. I hope you pick up a copy. And I hope it creeps you out. A little. « Happy Book Birthday to THE INN BETWEEN!